I recently found my way to a random blog about CELTA course experiences (something a teacher trainer should never do!) where one candidate bemoaned the lack of meaningful focus on reflective practice on the course. This was a candidate who had previously qualified as primary or secondary teacher where this was a strong part of their experience there. This got me thinking: How much do we actually do this? How much does our training genuinely facilitate the development of a truly reflective practitioner? Or does it just consist of token (and at times ineffective) gestures, if anything at all? As such, observation and reflective practice is used in a wide variety of industries as an innate part of industry practice. It is a form of practice-based professional learning focused on the experiential domain, rather than simply theoretical knowledge, and is used in healthcare, management, coaching, etc. These are often said to be industries in which other people participate in what you do and see you at work (at least to start with). What’s different about fields such as counselling or teaching is that you are alone in your room for most of your career. Sure, you can get feedback from your learners, but this is not the same type of feedback you will get from another trained educator or yourself. In education, it refers to the process of studying one’s teaching methods and behaviours and determining what works or doesn’t work for learners, either cognitively or affectively, in given contexts. In other words, it is a form of metacognition for the educator (Hartmann, 2001). Developing effective reflective practice skills in any teacher means that they can self-direct their own development as much as possible. Warning! This next section gets a bit theoretical. You may want to skip this part and get straight to the juicy bits and helpful suggestions in the next sections. The notion of reflective practice in adult education has been hugely influenced by experiential, constructivist and humanistic views of learning and teaching, going back to early educational theorists such as Dewey, Vygotsky and Piaget, but has parallels in other industries and is reflected in the likes of humanistic psychology/psychotherapy. Many of these influences can find their precursor in the classic scientific method that arose in the Western world during the Enlightenment. The concept was developed into more ‘codified’ forms by the likes of Kolb’s cycle (1984) which is based on the transformation of information into knowledge, as the diagram below illustrates. (New) knowledge is continuously applied/reapplied, building on the existing experiences and knowledge of a practitioner (educator or otherwise). But this then raises the question: What do we actually DO with this information we gather? Argyris and Schön (1978) suggested that analysis of data or performance followed by relying on existing strategies, techniques or policies to manage a similar situation in future could be termed ‘single loop learning’; whereas, relying on modifying those strategies, techniques or policies to manage such situations in the future can be understood as ‘double loop learning’, as the diagram shows. It all sounds rather scientific. If you’ve managed to read this far be warned, it starts getting a bit touchy-feely now. 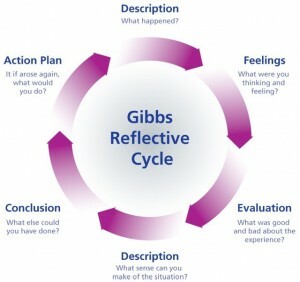 A more humanistic approach was developed by Gibbs, with his process of structured debriefing in his ‘reflective learning cycle’ (1988) built on Kolb’s ideas. The diagram is reasonably self-explanatory. They are legion when it comes to this topic! The above might all sound a bit too theoretical for the average teacher-trainer, which might be fair enough, but an understanding of the likes of Kolbs, Gibbs and Argyris/Schön’s ideas might better inform our practice as teachers and teacher educators. Reflective practice is one of those buzzwords that is thrown about, often I feel, with little (or no) understanding of what it really means, or little (or no) application of it, as per the example cited from the blog. As such, although it is an established part of most ELT training or development courses (Loughran, 2002), I think many teacher educators either don’t know what it really is, don’t know how to implement it, or else implement it poorly. While these are all perfectly commendable ideas, these are not innovations. Many trainers I know have used these techniques for years. I feel the very fact that these ideas are assumed to be innovations, says more about the state of current practice in teacher training than anything else. Personally, I find this a slightly grim prospect if this is what teacher educators are considering ‘innovations’. What does this say about how they normally manage the observation or reflection process? Also consider how Schön (1983) describes two key processes: ‘Reflection-in-action’ and ‘reflection-on-action’. The former is prospective and/or in-the-moment, the latter retrospective. Most forms of reflective practice tend to fall into the latter category. The former might be dealt with superficially by getting candidates to anticipate problems and solutions with their lesson when lesson planning; however, few practical tools are provided to enable teachers to make decisions in-the-moment where key (and often quick) decisions could prove very fruitful to a more successful learning process (we usually just dismiss this with a ‘It comes with experience.’ type of attitude). Akbari (2007) also points out how ELT practitioners are not typically encouraged to situate their reflective practice sufficiently within the context within which they are teaching. Rather, they are provided with traditional techniques which reflect generic rather than context specific development possibilities. Akbari further goes on to discuss how such techniques often bypass the element of personality and how personality influences the way one teaches, citing how the affective domain of the teacher can easily be ignored in favour of focusing on the affective domain of the learners (2007:10-11). Such affective factors can impact on a teachers’ willingness and even ability to reflect critically and honestly on their performance to start with. Finally, there has also been little research to suggest that reflective practice does actually make a difference to higher levels of learner (or teacher) achievement (Griffiths, 2000). Of course, impressionistically I very much beg to differ! Don’t rely on a single set of tasks, have a bank of options to draw on. Differentiate tasks for different stages of the course/individual lessons. Differentiate tasks dependent on the group and/or individual. Some candidates/teachers may need to work through their own feelings about their lesson before being able to expect them to deconstruct it more objectively as per Gibbs’ (1988) model. Ensure some tasks are more scaffolded for those who need it. Much like a journal, the lessons from the Classroom Assignment on CELTA could be integrated throughout the course with an end of week instalment, much like it is on the Delta with the Professional Development Assignment. This keeps reflective practice integrated and continuous. The weekly instalment above could even be preceded by a regular debriefing session e.g. at the end of each week where candidates review and compare (in pairs, groups, etc.) what their most valuable observation and reflection experiences that week were and why. This helps make the process more dynamic and interactive and potentially facilitates collaborative learning. Let candidates lead the process of reflection, observation and self-directed development more. Let THEM decide what they want to be observed for at relevant stages of a course. Let THEM decide what their action points will be (this can be embedded into Self-Evaluation Tasks). Let them design some of their observation tasks; treat them as tools for gathering genuine data, data that they want (and hopefully need). This helps make the process more individualised and goal orientated for the developing teacher. Get candidates thinking about how to apply and re-work what they’re learning on the course to other contexts (especially if they already teach in a different context). The CELTA was never meant to be a universal panacea; essentially, it takes a single control group in one single context and employs a set of methodological techniques consistent with Communicative Language Teaching. It was never meant, and it still cannot be, everything, to everyone (the way we teach a conversation class in Japan will be different to how we teach four year olds in Italy or an EAP class in Russia). The four-week nature of the programme means that it can only limit itself to the one context that the course is being delivered in. This does not invalidate the award; indeed, it would be impractical to do anything else (such as moving to a different country and age group each day of the course!) Rather, it means that, given the constraints of the programme, teacher educators need to be extra vigilant about helping course participants think about how to apply and re-work what they’re learning on the course to other contexts (especially if they already teach in a different context). We could also ask candidates to consider how they could facilitate organizational change in their context based on what they’ve learnt on their course. This goes some way to facilitating Argyris and Schön’s double loop learning (1978). This kind of reflection could be embedded into input sessions focused on Teaching in Different Contexts (rather than simply loading them up with more content about those different contexts). 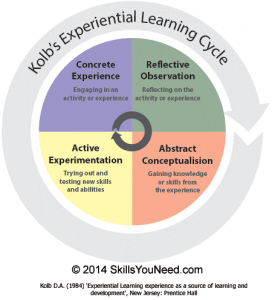 Or it could consist of distinct reflection tasks embedded at other stages of the course, e.g. a weekly debriefing session, or it could even be an area of focus in an assignment. Heaven forbid we should have a thinking teacher! Akbari, R. (2007). Reflections on reflection: A critical appraisal of reflective practices in L2 teacher education. System An International Journal of Educational Technology and Applied Linguistics. 35 (X), 192-207. Argyris, Chris; Schön, Donald A. (1996) . Organizational learning: a theory of action perspective. Addison-Wesley OD series. 1. Reading, MA. Gebhard, J. (2005). Teacher Development through Exploration: Principles, Ways, and Examples. TESL-EJ . 9 (2), 1-15. Gibbs, G. (1988) Learning by doing: A guide to teaching and learning methods, Oxford Centre for Staff and Learning Development, . London: Further Education Unit. Griffths, V., 2000. The reflective dimension in teacher education. International Journal of Educational Research 33, 539–555. Hartman, Hope J. (2001). “Teaching metacognitively”. In Hartman, Hope J. Metacognition in learning and instruction: theory, research, and practice. Neuropsychology and cognition. 19. Dordrecht; Boston: Kluwer Academic Publishers. pp. 149–172. Schön, D. (1983). The reflective practitioner: How professionals think in action. New York: Basic Books. Wikipedia. (2016). Reflective Practice. Available: https://en.wikipedia.org/wiki/Reflective_practice. Last accessed 18th Oct 2016.